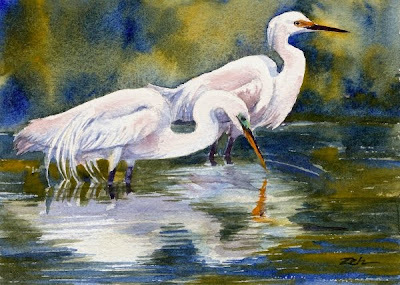 A Great Egret - in the foreground - and a Snowy Egret share the shallows of a pond. Isn't this a serene painting? I can just hear the soft plopping sound as they dip their bills and wade through the water. This painting has been sold. See more of my art for sale by visiting my website: zehoriginalart.com. Thanks for stopping by today.